Artisans, handymen, and even greenhorn electricians use nut drivers nearly on a daily basis to tighten or loosen various bolts and nuts. To this add repairing or working on HVAC/R panels and stacked circuit boards. Their proliferation in the modern work is informed by incorporation of electrical components in virtually all electrics devices, meaning they have increasingly become very indispensable. Couple that with their ease of use, versatility, high performance, durability, and affordability and you suddenly understand why nut drivers are electricians’ first and only resort. This article is intended for both greenhorn electricians and the seasoned looking for their first nut driver set or to upgrade. Unfortunately, while the sudden proliferation of nut drivers helps keep prices down through increased competition, it nonetheless complicates matters for those looking to buy one, mainly novices. You have to exercise an abundance of caution to ensure you get the right type and size. Using the wrong nut driver on a bolt or nut is capable of causing irreparable damage to the entire system and could damage the driver itself. To simplify the process for you, we’ve put together a list of ten of the best nut driver sets on the market. Considerable effort, time, and research went into compiling the list, so rest assured that irrespective of your choice, you still get to enjoy the best of all worlds. The Klein Tools 647 Set with 6-Inch Shanks comes with all the hallmarks of an excellent nut driver set. We'll begin by giving you a quick overview of the major highlights. The set contains a versatile collection of seven differently sized pieces, all with their separate 6-inch shanks, which means it's an ideal tool for working on electrical and HVAC/R panel and stacked circuit boards. And as the name makes the bare, it is one of the most practical and usable nut drivers on the market, seeing as the grip spots a comfortable cushion. The construction quality is top-notch, and they have these useful and time-saving magnetic tips that are perfect for working in tight and awkward spaces. 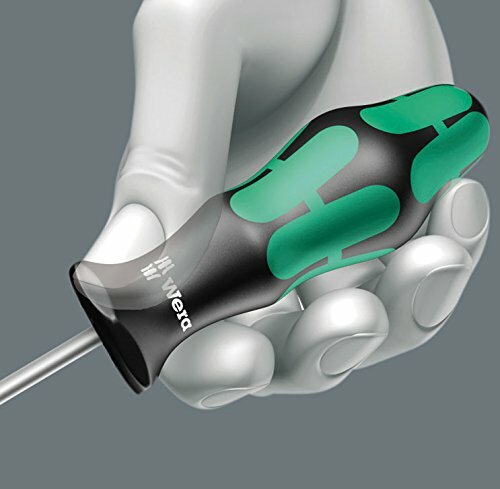 Everything considered, one of the unique selling points of the nut drivers is the hollow centre design, which becomes handy for taking out those long bolts in hard-to-reach spots. A unique highlight, as was briefly indicated in the overview, is the full hollow shafts of the nut drivers, with the notable exception of the 3/16-inch shaft. The feature allows the user to quickly dislodge the most stubborn, rusted nuts and bolts with the least energy. The feature works particularly well with long bolt projects as it fully engages the nut, holding it securely in place. Couple that with the rare Earth magnetic tips and you have a tool that offers seamless and flawless operation irrespective of the project you intend to undertake. Because of their chrome plating, the shafts are good at resisting corrosion and rust, which gives you the confidence to use the nut drivers in damp places. The ergonomic design of the handles of the seven nut drivers allows for comfortable operation for long hours on end. You don't have to worry about straining your hand muscles or suffering hand fatigue from prolonged use. The fact that the handles feature cushioned grips adds to the comfort and make it relatively easy for the user to apply maximum torque for dislodging the toughest nuts and bolts. The professional design and engineering further enhance ease of use as they have internal flanges that provide reliable, twist-resistant shaft anchor. Together, these features efficiently take the time and effort away from using the set, making the better alternative to traditional, time-consuming and laborious methods. 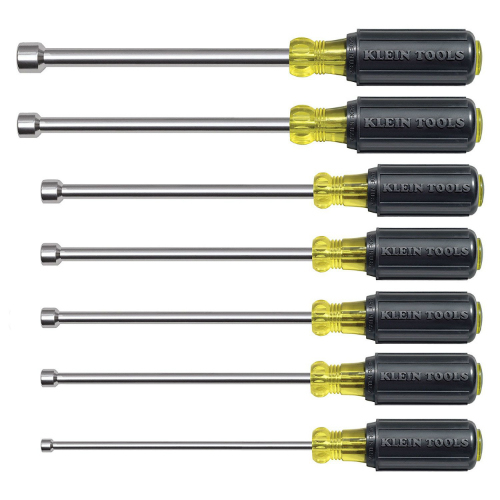 The Klein Tools 647 set has a broad assortment of nut drivers that professional electricians and enthusiastic Do-It-Yourselfers use on a frequent basis. The set comes with the following nut drivers: 646-3/16M, 646-1/4M, 646-5/16M, 646-11/32M, 646-3/8M, 646-7/16M, and 646-1/2M. All the units' handle domes are colour coded to make it easy to differentiate one nut driver from the others, meaning that you won't be wasting too much time comparing them. To ensure portability and easy transportation between different workstations, especially those that are remotely located, the manufacturer provides the user with a useful carrying case for storing all the pieces. The sturdy and heavy-duty case also guards against the likelihood of misplacing or losing the pieces, particularly for those who work in busy industrial settings. The set gives you the confidence and self-assurance to tackle a wide range of electrical applications both domestically and on a commercial scale. The professional construction and engineering of the nut drivers in the set provide for quick and effortless tightening and loosening of the tightest and most pesky bolts, nuts, and studs. Because they have hollow shanks, they are ideal for working with long bolts and nuts. All the seven pieces spot cushion grips to enhance comfort and your hold is both firm and secure. Plus, considering their overall construction quality, practicality, and ease of use, they are surprisingly cost-effective. Their intelligent design and durability make them the go-to tool for the vast majority of electricians, the weekend warriors, and extreme Do-It-Yourselfers. Milwaukee is one of the most established and customer-trusted manufacturer of power and home improvement tools. With its exceptional expertise and invaluable experience spanning several years, the brand continues to carve its own path in the industry, and its products have increasingly become synonymous with convenience and user-friendliness, which has seen the demand for its products soar all over the world. 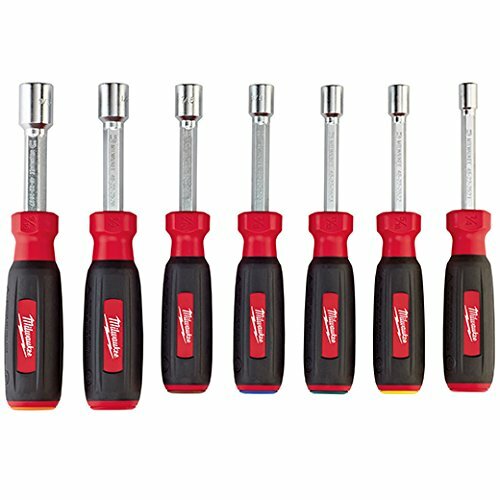 One of its flagship products in the home improvement niche is the Milwaukee 48-22-2507 Magnetic Set (7 Pieces). While there is very little difference among the several nut drivers on the market in terms of quality, performance, and ease of use, this nut driver sets itself apart with a host of auxiliary features and specs. Hold any of the seven pieces in the set, and you'll immediately begin to appreciate the industrial-grade construction quality. Some manufacturers compromise on the quality of construction to keep costs down. The set, on the other hand, goes all the way. The seven pieces perfectly balance all the important aspects that make a great nut driver. First off, all the pieces in the nut driver set feature the innovative thread-thru design that has manifold advantages. The most apparent advantage is bringing the most hidden and hard-to-reach bolts and nuts within easy reach. Secondly, the products' unlimited depth makes them the most suitable for use with threaded rods and long bolt projects. The depth of the set considerably reduces the amount of effort the user has to apply to tighten or loosen even the most rusted and frozen bolts in furnaces. A little force generates lots of torque that quickly and easily dislodges the stuck nuts. Aside from its universality, set also come with magnetic heads for that trouble-free and smooth operation. Compared to the magnetic heads of other nut drivers, the magnetic heads on these models are easily capable of accommodating up to four times more nuts and bolts, including hex, 12-point, and spline drives. Unless you're a seasoned electrician with a trained eye, it might be difficult picking out or differentiating one nut driver from another. To make it easy, the manufacturer has thoughtfully and conveniently colour-coded them, allowing you to select the right one for the job quickly. You can choose between any of the following nut driver sizes: ¼ inch, 5/16 inch, 11/32 inch, 3/8 inch, 7/16 inch, ½ inch and 9/16 inch. A third highlight is their high-quality construction. The construction of the hex shanks from high-quality and commercial-grade steel, and their additional forging and plating with chrome gives them absolute durability, thereby guaranteeing continuous use for several years into the future. The chrome plating is similarly responsible for keeping rust and corrosion at bay. With proper use, the drivers should easily last more than a lifetime of smooth, stress-free use. In conclusion, allow us to reiterate once again that the Milwaukee 48-22-2507 set is as versatile, high-performance, easy to use, and durable as they come. The thread-thru design of the driver provides for smooth and effortless handling of threaded rod and bolt projects. The magnetic head can accommodate as much as four times the number of fasteners compared to off-brand models. The durability of the drivers, coupled with the fact that they come with a lifetime warranty, makes them the perfect choice for tightening and loosening those frozen, pesky and tough nuts and bolts. It'll be hard to find a better deal within its affordable price range. 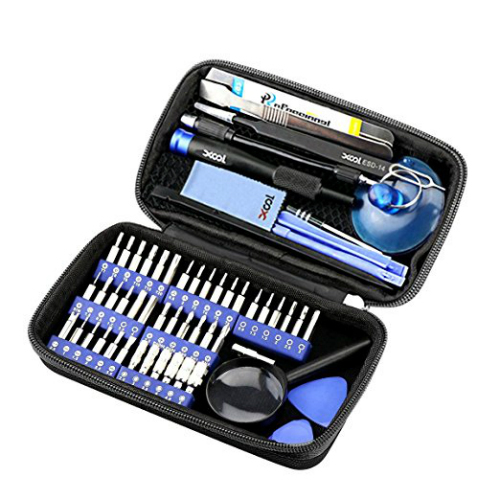 No nut driver set best epitomizes versatility and flexibility much like the Xool 58 in 1 Precision Screwdriver Set does. Reaching tiny nuts and bolts in different electronic devices like iPads, iPhones, personal computers, watches, laptops, mobile devices, among others is tedious and involving process. Without the right tools and skills, it quickly proves to be a fruitless endeavour. With the kit, however, you can easily and quickly reach those small nuts with ease. The kit brings out the best in you as a professional or amateur electrician, and enables you to take on a wide range of electrical projects both around the house and on a commercial setting. The kit comes with a mind-boggling 42 different nut drivers, way more than most nut driver sets on the market offer. The first obvious implication of the generous assortment of nut and screwdrivers is that you get to save some tidy sum you would have otherwise spent acquiring individual pieces from the market. The second and most important implication is that you now have, at your immediate disposal, a collection of all the commonly used nut and screwdriver pieces to allow you effortlessly and hassle-freely meet every demand you have. Whether it is prying open an iPhone or repairing a MacBook, you all that it takes. When it comes to ease of use, everyone will have a breeze with it. That includes not only the seasoned and professional electricians but also the senior members of the society, greenhorns, and those who are technically disinclined. Coupled with the flexibility and durable construction of the shaft extensions, you can quickly reach all those hidden or hard-to-reach spots that were previously inaccessible with traditional equipment. Furthermore, the package also comes with a magnifying glass to make it easy to see and work with diminutive precision components. 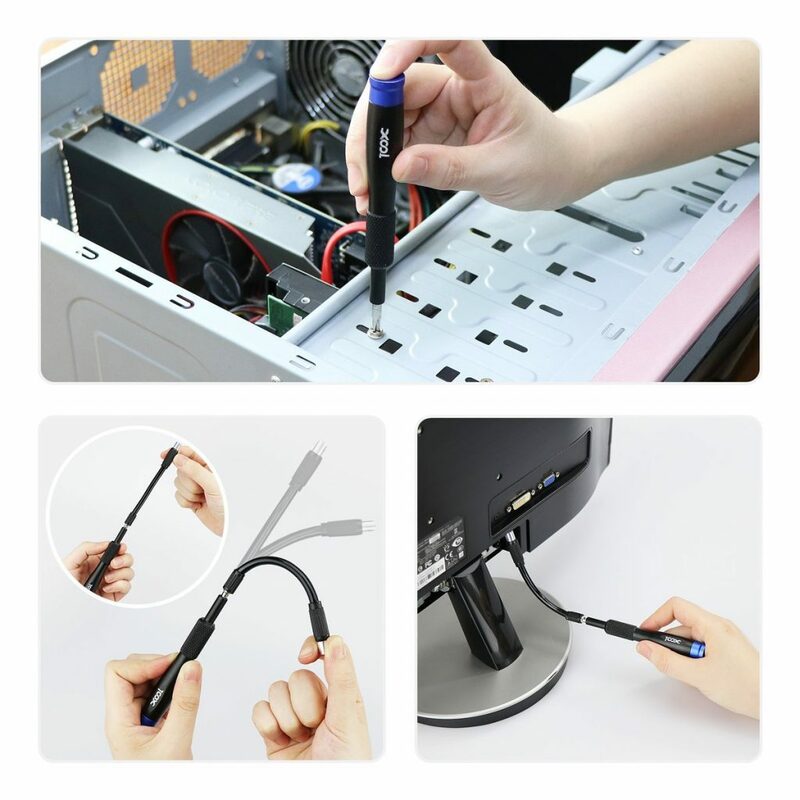 You'll also get to use all these ergonomically designed and time-saving tools to quickly pry open different electrical components, thus improving your efficiency. Going by this description, it quickly becomes apparent that the kit is one of the best nut driver sets to use for all your electrical projects. It provides for smooth and quick work. All the nut and screwdrivers also feature a non-slip handle for that extra comfort. The head or tip of the drivers is magnetized, meaning that increase convenience and ease of use when you have to pull nuts and bolts from tight and hard-to-reach spots. They help you line up the nuts with the hole for faster removal. The high-quality construction allows it to stack up pretty nicely against products offered more established and renowned manufacturers. Like them, the Xool brand only uses the best materials to make its driver nuts. All the forty-two nut drivers in the set feature all-CR-V steel construction. Consequently, they are hard, tough, strong, and long-lasting, which, together with the brand strict adherence to the highest construction and safety standards, makes the set one of best candidates for undertaking all the rigorous electrical work. Also, the construction of the flexible extension with elastic plastic means it would break with ease even when subjected to the rigors of electrical work. The CR-V steel is also coated with a material that’s resistant to rust and corrosion. That level of construction and engineering gives you the much-needed confidence to take on the most challenging and complex electrical projects, in addition to enhancing your productivity and efficiency. 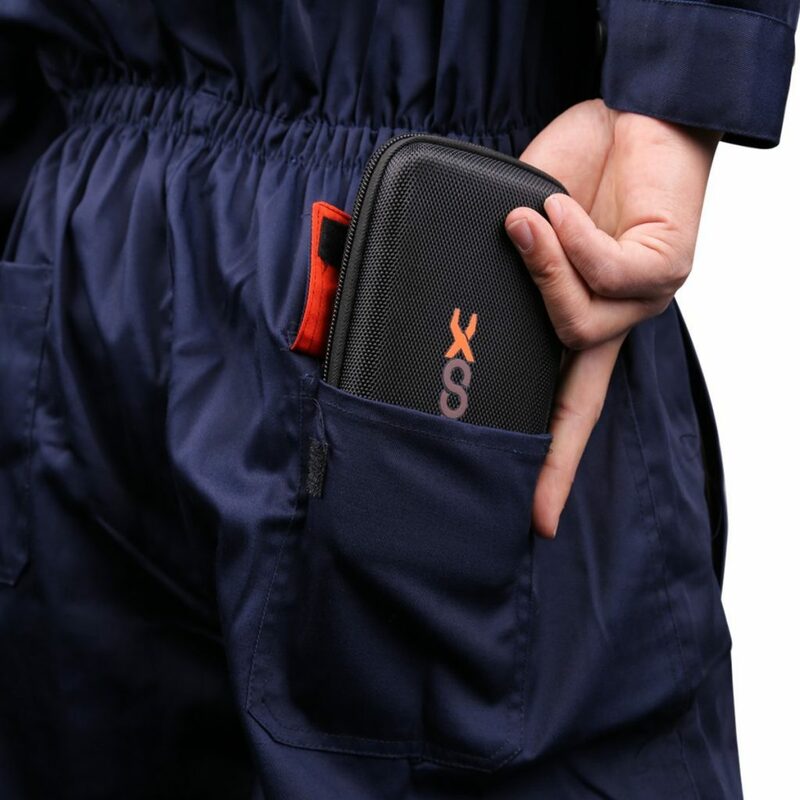 The Xool brand does not task you with the responsibility of finding a suitable carrying case for all the 42 nut and screwdrivers. It provides you with a sturdy and heavy-duty storage bag whose lightweight and handy design significantly increases portability and provides for unrestricted movement. The bag helps you keep the pieces safe and protected from damage and misplacement, especially for those working in busy settings. To summarize, the Xool 58 in 1 Kit is a multifunctional kit that will come handy for performing a wide range of electrical tasks. It has everything you need to help you complete your project is a quick, safe and efficient manner. Plus, it is cost-effective. That’s a deal that’s hard to beat. Given DeWalt's standing in the power and home improvement industry, we don't really have to go out of our way extolling the positive attributes of its products to sway your purchasing decision. However, in light of the stiff competition from equally competent manufacturers, we can't make assumptions. One of their best products is the DeWalt DWPVTDRV set. The performance of the nut driver set is beyond reproach. It does its job exceptionally well, and with an ease and at a speed that would put other nut drivers to shame. Essentially, it is the perfect embodiment of versatility, durability, usability and practicality and high performance. To learn more about the experimental features the set offers its users, continue reading. Admittedly, it comes with a premium price tag that the vast majority of professional and even greenhorn electricians might find a little discouraging. 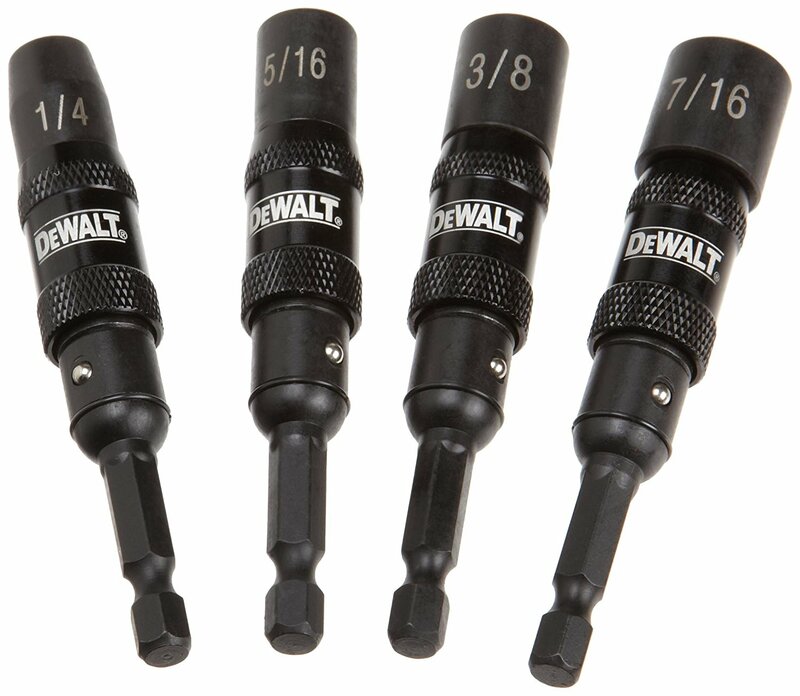 To make it even more perplexing, the nut driver set only comes with four nut drivers at a time when the vast majority of nut driver sets have anything between seven and eighty. Consequently, the price might seem high and unjustified. That’s until you take a closer look at the features, specs, and capabilities of the four nut drivers in the set. The design and engineering of the four pieces make them the best set in the industry. Beginning with aesthetics, it is attractive and sleek and have a distinct colour that will allow you to locate them with ease in a busy toolbox. The sizes are clearly engraved on the handles to allow you different one nut driver from the other, thereby helping you to save on time. You can easily choose between the 1/4-inch, 5/16-inch, 3/8-inch, and the 7/16-inch nut driver sizes, in accordance with the size of nut or bolt you want to tighten or loosen. On a similar note, you'll appreciate the ergonomic design of the drivers. They are comfortable and easy to hold for long hours. Because of their rubberized grip handles and the fact that they feature lightweight and compact design, you don't run the risk of suffering hand strain or fatigue. Also, because they are light, you can control and manoeuvre them with ease when there is a need to access to those tight and hard-to-reach spots. The next step in justifying the premium pricing is looking at the construction quality. Just by looking at them, you can tell a lot of thought and resources went into the manufacturing process. The DeWalt DWPVTDRV reeks of high-quality construction using the best materials available in the industry. Their impressive durability and ruggedness make it possible for the user to pair them impact drivers without the possibility of breakage. Hence, they are not a case study in depreciation. Consequently, you should feel free to subject them to heavy-duty work every once a while without worrying about them depreciating quickly like other off-brand models would. Also, they boast moderate heat resistance and easily withstand rust and other corrosive agents. As for performance, you can bet the set is no slouch. Unlike their fixed-tip counterparts, the nut drivers are better placed to allow for a quick and effortless reach to nuts and bolts in tight spaces, thanks to their pivoting tips. The tips can pivot to an impressive 20-degrees to give you access to the most hidden nuts, which when paired with an impact driver, enables you to tighten or loosen nuts quickly and easily. The heads incorporate high-strength and long-lasting magnets for quickly and effortlessly lining nuts for tightening or loosening in tight corners. You don't have to worry about them falling off. True to its name, it also spots recessed corner and a patented geometry for reducing the rounding of the hex and minimizing shaving when driving on flats, respectively. In all, the DeWalt DWPVTDRV is a perfect tool for pairing with wrenches and impact drivers when you need to loosen stuck, frozen, or tight bolts and nuts or to tighten them. The nut drivers pack several impressive features that easily make them the go-to kit for the vast majority of seasoned electricians and even greenhorns just getting started with electrical work. Some of the features are a patented geometry, an advanced hardening process that guarantees absolute longevity, recessed corners that allow you to drive on flats while minimizing shavings, 20-degree pivoting tips, and industrial-strength magnets for retaining your nuts and bolts. While the package has only four drivers, they are the ones you're most likely to use. You can choose between a 1/4-inch, 5/16-inch, 3/8-inch, or the 7/16-inch. Lastly, but equally important, the set is reasonably and justifiably priced. Another practical and function nut driver set currently on the market comes from the customer-trusted and highly reputed Tekton brand. While the set is not very different from other nut driver sets on the market, it offers the user a few unique features and specs that make it stand out. Facets like high-quality construction, versatility, durability, ease of use, and affordability are a common denominator for the vast majority of nut driver sets featuring on this list. 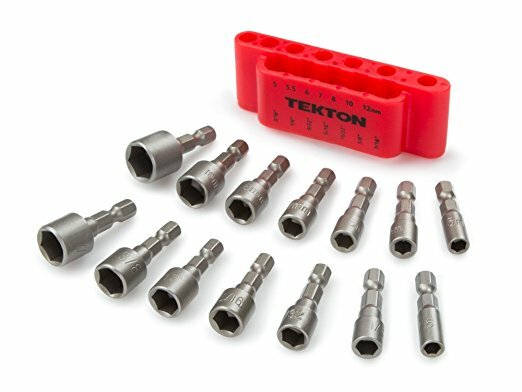 Tekton’s flagship product, the Tekton 2938 Quick-Change Power Nut Driver Bit Set with Detents, offers the user much more. Let’s delve into an in-depth review of the nut driver set to find out more. The Tekton 2938 Quick-Change Bit Set with Detents easily claims the title for the most versatile nut driver on the market despite providing the user with just 14 pieces. First off, 14 nut drivers are just more than enough for taking on a wide range of electrical projects both at the domestic and commercial level. You can choose any SAE size ranging from 3/16-inch, 1/4-inch, 9/32-inch, 5/16-inch, 11/32-inch, 3/8-inch, and 7/16-inch. For metric sizes, you have the liberty of choosing anything between 5mm, 5.5mm, 6mm, 7mm, 8mm, 10mm, and 12mm. The comprehensive collection of Metric and SAE sizes easily makes it a go-to nut driver set for all weekend warriors and professional contractors in search of a versatile set. And just to add to the versatility, the design allows you to quickly and effortlessly pair the nut drivers with a power driver of your choice and even a screw gun. Also, without a carrying case, it might be difficult to move around with all the 14 pieces. Nevertheless, the Tekton, in their endeavour to enhance ease of use and convenience, provide the user with a compact storage clip for keeping all the 14 pieces within easy reach. That's in addition to a wide belt clip for carrying them while moving from one station to another. Unlike other off-brands, Tekton offers the user the best of all worlds. The construction quality, like its usability and performance, is top-notch. The construction of the nut drivers using forged and hardened chrome vanadium steel gives it the requisite ruggedness and durability to take on the toughest and most tasking projects. Whether your nuts and bolts are frozen, pesky, or just won’t come loose, trust the nut driver set to make short and easy work of it. The sturdy construction also helps moderately with heat resistance, meaning that you don’t risk your hands getting too hot when trying to dislodge the toughest nuts. On a similar note, all the 14 pieces feature a sandblasted finish to ensure corrosion and rust don’t pose any problems, especially for those working in dump conditions characterized by the presence of several corrosive agents. An additional feature is the inclusion of universal 1/4-inch hex shanks capable of securely and fitting quick change chucks and several other attachments. Also, the user gets to enjoy peace of mind with the lifetime warranty for replacement of defective pieces. Lastly, the set, in the spirit of usability, is both lightweight and compact to minimize hand fatigue and strain for those who work for prolonged periods at a time. Overall, the Tekton 2938 set bcomes with a host of instrumental features that just make it stand out. You get to use 14 of the commonly used nut drivers at an affordable price point, and all of them are compatible with a 1/4-inch shank. The construction of the Metric and SAE bits using forged and hardened chrome vanadium steel together with the corrosion-resistant sandblasted finish gives the set the ruggedness and strong build it needs to effortlessly and quickly power through the toughest nuts and bolts. It is worth investing your money. For professional electricians and greenhorns or the weekend warriors looking for a new experience, we present to you the Ares 8-Piece Metric Set. The Ares brand might not be as famous with electricians like DeWalt and the others are, but they do a pretty good job making some of the best nut drivers on the market. The eight pieces in the set are metric models, so they should be enough for performing a wide range of electrical tasks here and there. You get all the sizes you can want and a useful storage rail for keeping all the pieces, so they don't get lost or misplaced. Let's not waste more time and get started with reviewing the technical aspects, shall we? The set is similar to other nut driver sets on this list when it comes to the quality of construction. The use of impact-grade chrome vanadium steel, for instance, ensures maximum durability while significantly minimizing wear and tear occasioned by using the drivers to dislodge tough, pesky and rusted nuts and bolts. That's in addition to the fact that all the eight pieces feature a manganese phosphate coating, so that corrosion and rust don't affect their performance and durability. With a little care and proper use, the Ares 8-Piece Metric Magnetic Impact Nut Driver Set should easily provide you with more than a lifetime of flawless and trouble-free operation. The usability and performance far exceeds expectations, and even overshadows nut drivers offered by some of the more established brands. You get to take advantage of the 1/4-inch hex shank that you can also pair with most standard drill chucks to reach those nuts and bolts in tight and hard-to-reach spots, thanks to the 6-inch length of the pieces. The pieces come with industrial strength magnetics at the tips for superior bit retention, thereby allowing you to line up the nuts for easy and quick tightening or loosen the tough ones without dropping a single one. It’s such convenience and ease of use that makes it electricians' first preference when looking for a replacement or an upgrade. The sizes of the metric nut drivers in the set, from the smallest to the largest, are 7mm, 8mm, 9mm, 10mm, 11mm, 12mm, 13mm, and lastly 14mm. With the full range of nut driver sizes at your disposal, there is nothing you can’t do. You can easily and quickly build racks, mount panes, and even work on gears. Snapping them into your impact driver gives the leverage for generating high torque, enabling you to dislodge the toughest or frozen nuts effortlessly. It's not enough to write – or read – about the reliability, effectiveness and the efficiency of the set. You have to try them out to fully appreciate their ease of use and off-the-charts performance. Their extended length, durability, compatibility with standard impact drivers and powerful magnets means your work is generally cut out for you. The set makes short and quick work of any project, allowing you to reach all those places you couldn't reach before. Should their performance fail to meet your expectations, you can take advantage of the brand's Performance Assurance or get a refund. If you don't have this already, just drop everything and get it! If you don't find the features and specs we've so diligently extoled out not convincing enough to sway your purchasing decision, we don't know what will. Maybe a quick recap will. 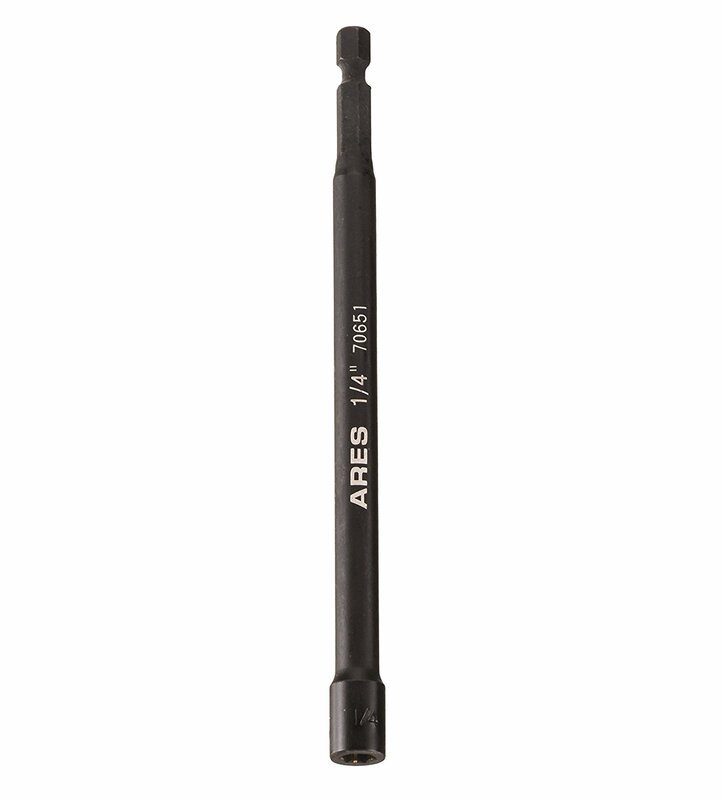 The Ares set offers you all the nut drivers an electrician dreams of. The versatile collection even has magnets at the tips for bit retention and have a handy storage rail. The metric nut drivers are accompanied by a 1/4-inch hex shank that's compatible with standard drill chucks and that enable you to reach those hard-to-reach nuts and bolts. It never gets better than these. To this also add the advantage of affordability. 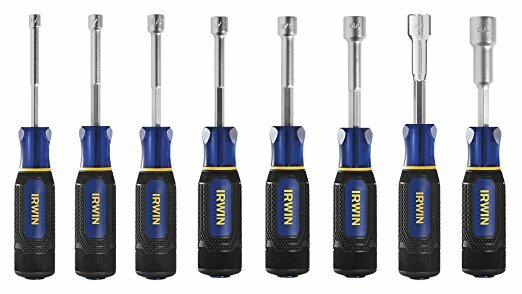 Another high-performance, easy to use, and durable nut driver set you can find on the market is the Irwin Tools 1948790 Set with a total of eight versatile nut drivers. Two of its most distinguishing features include the acetate handles and the six-sided heads. Aside from these two, the set has similar features and specs to most of the nut driver sets featuring on this least. For instance, it's reasonably priced, features durable construction using high-quality materials, and is a versatile choice, seeing as the Irwin Tools 1948790 SAE Nut Driver Set comes with eight versatile nut drivers for taking on a wide range of application both at the domestic and commercial level. Professional tradesmen who truly appreciate the performance, comfort and reliability will settle for nothing less than this set. Its design and engineering make it easily one of the best nut driver sets you can reward yourself with. It's easy to use on a daily basis on light-duty, medium-duty, and even heavy-duty applications, and in all circumstances, its performance will invariably be exemplary. All the eight pieces spot acetate handles that do a great job with the tools' longevity, the demanding nature of some high torque projects notwithstanding. As for ergonomics, the design aims to enhance user safety and comfort. No one wants to have blisters all over their hands after a few minutes of trying to dislodge nuts and bolts, or do you? Me neither. Hence, the ergonomic design of the handles seeks to minimize, as much as possible, hand fatigue and stress, which in turn allows you to work for hours on end. The pieces come with three zones of comfort to provide for comfortable all-day use. All the eight pieces have a six-sided head for effectively engaging the nuts that need tightening or loosening. The design ensures a perfect fit, guaranteeing that the head fits securely and grips the nuts precisely without leaving any room for loose play, which is particularly important if the nuts you are attempting to loosen are tightly clamped or rotten or frozen. A second advantage to the perfect fitting is minimal stripping and a longer shelf life. And in case you’re dealing with considerably long bolts and nuts, fret not because this set has your back covered. The pieces have a hollow shaft that easily accommodates the length of the longest nuts, allowing you to spend little time and use minimal effort in accomplishing your project. Additional features include a sturdy carrying case to ensure you don’t misplace any of the pieces and to allow you move with relative comfort from one station to another. Also, you have a warranty that panders to the needs of the vast majority of professional tradesmen looking for nothing short of exceptional performance. The package is lightweight, so it doesn't burden you with too much weight. It is also compact enough, so it fits easily in your toolbox, glove compartment, and even the backpack, meaning that portability is guaranteed. To conclude, there is no denying that the Irwin Tools 1948790 set packs some of the best features a nut driver set can have. Even the indifferent praise the set for its ease of use, sturdy construction, durability and performance. The acetate handles considerably increase their shelf life while providing the user with utmost comfort. The best thing about them is you're free to hammer those pesky nuts and bolts if the conventional method of torqueing fails, thanks to the chip-resistant and long-lasting acetate handles. The set promises the best experience with any electrical project you choose to undertake. Definitely worth investing in. The Wera Tools brand is yet another popular nut driver manufacturer. Having been in the industry for several decades now, the brand has unquestionably mastered the art of producing some of the best, high performing, high-quality, practical and usable nut drivers on the market. Being a German company, the company strives to meet and surpass both local and international standards of safety and performance, meaning that their products are a safe bet for individuals, both greenhorn and seasoned, in search of nut drivers. We dive into an in-depth review in the following paragraphs, so keep reading. The Wera Tools has several flagship nut driver sets, but the one that most conspicuously stands out is the Wera 05029510001 Set, which comes with seven very versatile pieces. The nut drivers in the set include the following: 5.0 x 70mm, 5.5 x 70mm, 6.0 x 70mm, 7.0 x 80mm, 8.0 x 80mm, 10.0 x 80mm, and 13.0 x 80mm nut drivers. Needless to say, these are the pieces that professional tradesmen use on a regular basis when undertaking virtually all their electrical and other related projects. The set is an economical alternative as it provides you with all the pieces you need cheaply and in a single package compared to taking the more expensive and time-consuming route of buying all the eight pieces separately. The design of each of the eight pieces in the set aims at making your work effort and quick. Like some of the top-end sets on this list, it features hollow shafts for easy accommodation of nuts on long thread rods. Loosening the tightest, peskiest, and frozen nuts and bolts with any of the nut drivers is a rather easy endeavour, thanks to the incorporation of a Kraftform multi-component handle. The handle comes with both hard and soft zones, so it perfectly fits onto the vast majority of adult hands while simultaneously enhancing comfort necessary for the application of greater torque. Additionally, it features anti-roll protection at the base of the handles to make it impossible for the drivers to roll away when put on a flat surface. Coupled with the moderate heat resistance, the nut drivers can be used in all sorts of work environments, even those experiencing extremely low temperatures. And even though eight is not as many as say 40 or 80, still greenhorns might have a difficult time differentiating one nut driver from the other. To make it easy, all the eight pieces’ handle markings come with screw symbols and the size of the tip. Consequently, differentiating one nut driver from the others will be a breeze, especially for those just started with various projects. Additional features include a handy warranty for replacement of defective parts and the chrome plating of the pieces to protect them from the damaging consequences of rust and corrosion. However, you don’t get a storage box or carrying case. You’ll need to buy one separately to help you keep all the nut drivers safe and secure while working or during transportation. Lastly, if you are dealing with or planning to tighten or loosen hexagon head screws, the package includes a handy nutsetter for that purpose. 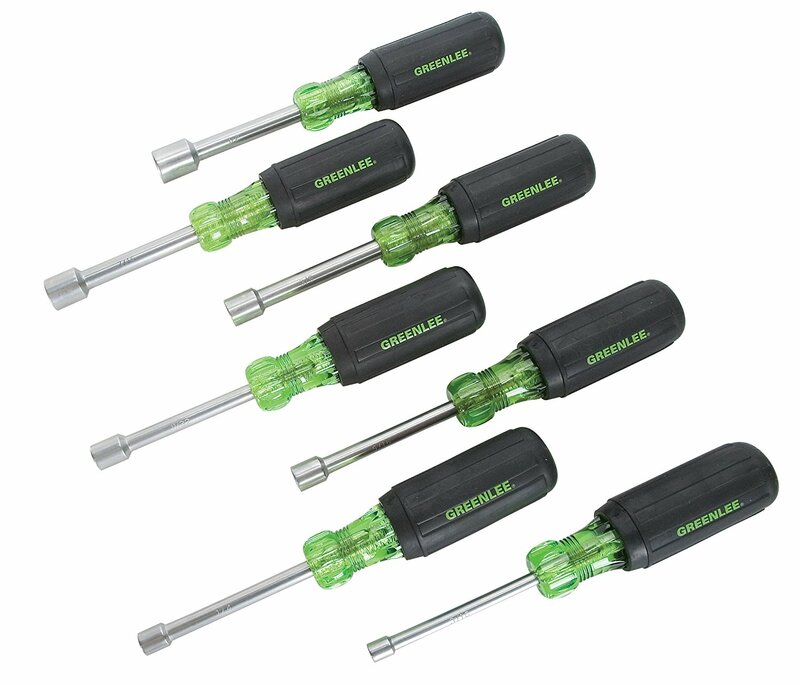 Overall, the Wera 05029510001 395 Set is an ideal choice for both professional and greenhorn workers in need of an effortless, quick and effective way of tightening or loosening nuts, bolts, and screws in hard-to-reach or tight spots. And while it lacks high-strength magnets and a carrying case or storage box, the performance of the nut drivers far exceed expectations. And the best part is that you don’t have to break the bank to afford them; they are a cost-effective alternative with just enough flair. Like DeWalt, the Craftsman brand needs little or no introduction at all to users of power and home improvement tools. The company has a significant share of the market and manufactures a wide range of top-of-the-line products, including nut drivers. One of their masterpieces, the Craftsman 9-4196 nut drivers, is still rattling features in the nut driver niche, even after being on the market for more than 10 months. And while its performance and convenience is at par with its other competitors on the market, it enjoys a high Trust and Brand Expectations score, which really resonates with individuals looking for reliable and smooth performance. Over the years, the brand has won several awards for its innovative design and expertise in the field. One of the most notable is the most preferred hand tool brand by Popular Mechanics. Additionally, the brand is the official tool brand of NASCAR and Do-It-Yourself Network. These awards are recognitions are indicative of the brand’s commitment to the production of high-quality products, one of which is the Craftsman 9-4196 Set. The 7 nut drivers in the set are all that you need to complete the suitable project you have in mind. You can choose between the following nut driver sizes in accordance with the size of nuts and bolts you want to tighten or loosen: 3/16-inch, 1/4-inch, 5/16-inch, 11/32-inch, 3/8-inch, 7/16-inch, and 1/2-inch. Because the manufacturer crafts the sockets and shafts from industrial-grade and durable alloy steel, the Craftsman 9-4196 is capable of withstanding the rigors of intense electrical work. The user will not experience any breakage of parts or a fast rate of wear and tear that typically plagues nut driver sets made from low-quality materials. You'll have to put these to use to truly appreciate their prowess at tightening or loosening bolts and nuts. The tougher the nuts, the more heat that the process will generate but it won't be significant enough to affect your performance as the steel will be dissipating most of it to the environment. Furthermore, the shafts of the nut drivers are sufficiently long to make it easy for you to use the set. The length gives you great leverage for applying force and torque necessary for dislodging the toughest and most stubborn nuts and bolts. To make that a possibility, the handles feature an ergonomic design to minimize hand strain and fatigue while increasing comfort and usability. Couple that with the lightweight characteristics of the drivers and the fact that they're easy to grasp and you have yourself one of the easiest to use nut driver sets on the market. Consequently, don't be surprised if you use it incessantly for hours on end without taking a break. The design makes the nut drivers feel like a natural extension of the hand. The Craftsman brand provides you with a convenient plastic carry rack, so there are no difficulties moving from one workstation to another with all the seven nut drivers. Thanks to the case, the likelihood of misplacing any piece will also be virtually non-existent as you can store them in the case in-between uses. A third advantage to having the case is that it keeps rust and corrosion at bay, meaning that the pieces will invariably maintain their optimal performance condition. Also, because of the colour coding of the handles, identifying the nut driver you want from the other six should be a breeze. With some care and maintenance, it should provide you with several years of faithful and reliable service, just like any other top-end nut driver set. Overall, there are several nut driver sets on the market you can easily choose from, some of which are more affordable than this set. However, doing so would mean you'll willingly be foregoing the convenience, reliability, and convenience that comes with using one of Craftsman's flagship products. You get to choose between different nut driver sizes ranging from 3/16-inches to 1/2-inches, hence versatility. The use of alloy steel ensures durability and gives you the confidence to take on those demanding electrical projects without worrying about wear and tear. Plus, each purchase accords you a Craftsman Forever Guarantee to cater for defects in manufacturing and performance. Patently one of the best nut driver sets you can find in the market. For handymen, contractors and electricians, very few tools are as indispensable as nut drivers. Predictably, a lot of thought goes into choosing the right one, which brings together the best of all worlds. One such tool is the Greenlee 0253-01C, and the fact that it comes last on this list should not be construed to mean it's the least preferred. Its performance, durability, and practicality easily trounce those of higher-placed sets. The nut driver set has several unique selling points some of which are the comfortable grip handles, integral flared shaft, high-quality construction, and chrome plated finish. An in-depth review of these facets follows in the subsequent paragraphs. The ergonomic design is one of the factors that make it immensely popular among electricians and handymen from all corners of the world. The handles, for instance, are rubberized to increase comfortability, and they also feature non-slip properties to guard against the possibility of them slipping off in the middle of a delicate operation. Additionally, it incorporates integral flared shaft and handle design that makes it impossible to twist the pieces even when the user applies great force. No matter how tough or pesky a nut or bolt is, you’ll be able to loosen or tighten it without twisting or breaking any of the seven pieces. Like all its competitors featuring on this list, the Greenlee 0253-01C is made from industrial-grade materials, making it rugged, sturdy, and capable of withstanding the vagaries of electrical work. In spite of the formidable construction, the nut drivers are surprisingly light-weight and compact and will be incredibly easy to control and handle for longer while trying to access hidden or tight spots. Aside from the integral flared shaft, all the pieces in the set also come with a satin chrome plated finish. Forgive the long, intimidating sound of the name, but it basically means that the set has remarkable corrosion resistance and boasts a professional look. In addition to the chrome plate finish and the integral flared shaft, it also comes with a host of instrumental features that make using it a cinch. The seven nut drivers each have hollow shafts for the effortless and quick removal of stacked or long bolts. Also, the tips are precision machined so they fit the bolts and nuts precisely and firmly so that even with the application of great torque, there will be no damage any of the crucial parts. And identifying the nut drivers from one another is made easy with the marking of all the handles, allowing you to easily find the most suitable size, type, and length for the project you intend to embark on. You can choose between the following sizes: 3/16-inch, 1/4-inch, 5/16-inch, 11/32-inch, 3/8-inch, 7/16-inch, and 1/2-inch. The nut driver includes a comprehensive assortment of nut drivers professional handymen use on a regular basis. So, you'll be getting a versatile nut driver set that will enable you to take on a wide range of projects both around the house and on a commercial scale. The fact that the Greenlee 0253-01C meets and patently exceeds specification set by such international bodies like ASME and ANSI means it is, without a doubt, one of the best nut drivers on the market currently. To this add ease of use, practicality, durability, affordability, and high-performance. Combined, these features put it in a well-deserved 10th position on our list of best nut drivers. For a lifetime of trouble-free and smooth use, this option comes highly recommended. It is necessary that the user attains greater torque to properly tighten or dislodge some of the toughest, most pesky and stubborn nuts and bolts. In that endeavour, low-quality construction just won’t do. The overall construction quality of the nut drivers, particularly the tips, shafts, and handles should be commensurate the nature of the project. Consequently, you need a nut driver or drivers made from durable and robust materials. The vast majority of nut driver manufacturers tend to use chrome vanadium steel or alloy steel, two materials renowned for their durability and lightweight properties. They can also withstand high temperature and extensive use on the toughest nuts and bolts. In the same vein, there are nut drivers that come with chrome plating, most notably on the shafts. The intention is to keep rust and corrosion from becoming a problem. As a result, the user can comfortably use the nut drivers under all sorts of weather conditions without worrying about wear and tear. The sole purpose of nut drivers is to help with tightening and loosening bolts and nuts. Your choice should have all the pieces that will allow you to do your job efficiently, productively and with the least interruptions. As a result, make a point of going for those that can help you undertake a wide range of applications both domestically and commercially. The set needs to have all the commonly used nut drivers, and they need to be of different sizes and types so that no matter the project, your back is covered. If possible, there should be an equal number of Metric and SAE sizes. Nut drivers with hollow shafts are desirable as they come handy for accessing nuts on long thread rods. If you need unlimited depth, it would be prudent to narrow down your search to those nut drivers featuring a thread-thru design. Usability and practicality are the other factors the user needs to take into consideration when shopping for a nut driver. It would be quite a waste investing your hard earned money in an expensive set that difficult to use. Manufacturers take several steps to ensure usability, the most obvious of which is the design of the handles. To these end, you can get nut drivers with cushion rubbers and others with soft, rubberized handles. Still, others have hard and soft zones. Irrespective of the design, the intention is to give the user additional comfort and better torque for removing those frozen or rusted nuts and bolts. Other convenience features include the provision of a carrying case or wooden handle for storing the pieces in between use and to ensure you don’t lose or misplace them while communicating or working. For sets with many nut drivers, the sizes are engraved on the handles, or they come colour-coded to make it easy to distinguish one nut driver from another. If you plan on reaching nuts and bolts in hard-to-reach spots, then make a point of getting one or a set with magnetic tips to help with bit retention. To save time and effort, it would be prudent to keep an eye out for these features and many more. Q: What is the difference between a nut driver and a screwdriver? A: Unless you are an experienced electrician, the difference between a nut driver and a screwdriver can seem almost marginal, a fact compounded by the presence of a cylindrical handle in both. However, the difference is vast. Electricians use nut drivers for securing and loosening bolts and nuts, of which the latter comes with a hexagonal design, which also incidentally informs the difference between the two. 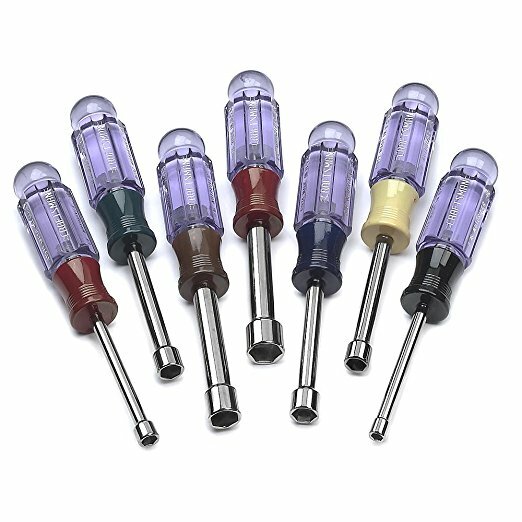 Unlike screwdrivers, nut drivers have ends or tips with hexagonal openings which slip over the nut. That’s it. Q: How do I ensure a lifetime of reliable and smooth nut driver use? A: Nut drivers can provide you with a lifetime of stress-free and smooth use if you take care of them. Among other things, you can religiously follow all the user instructions provided by the manufacturer. Also, cleaning your tool after every use and keeping them in a clean and dry environment away from water and other corrosive agents would go a long way. On a similar note, try to use just the right amount of force when tightening or unscrewing a nut to prevent twisting or breakage. Buying a nut driver is understandably an uphill task. Being fixated and invested in getting the choice right and minimizing mistakes with the first purchase puts some significant pressure on an individual. However, when you know the features and factors to take into consideration, the process can be enjoyable, quick, and productive. The first step, though, is evaluating your project to understand better the type or size of a nut driver that would be most suitable. Doing so helps you narrow down your list, save on time, and help you avoid making expensive mistakes. All the products on our list offer you nothing but the best. Whether you’re looking for versatility, affordability, ease of use, practicality, durability or exceptional performance, we’ve got it all. Plus, they are easy to use and don’ require you to dig too deep into your pocket.